From Active to Passive or From Passive to Cheaper Passive? It’s been awhile since we’ve weighed in on the active/passive debate so we thought we’d toss our hat in the ring yet again and try to explain the asset migration that is taking the fund management industry by storm. What we rarely, if ever, read about is an explanation for why point number two is a phenomenon. Answering this question goes a long way in explaining the reason it has made sense for so many folks to switch to passive type vehicles, but it also sheds some light on which funds active fund pickers might focus on. In the table below we show the average and median correlation and alpha (excess return) for the trailing 3, 5 and 10 years for all the mutual funds in the Morningstar US Large Blend category (institutional share classes only). These are funds benchmarked against the S&P 500 or something like it. Over each time period, we further show the percent of the funds with less than a 90% correlation to the S&P 500 and the percent of funds with greater than 1% alpha. With just these two data points in hand something striking stands out. Almost all the funds in the US Large Blend category tracked the direction of the S&P 500 at least 90% of the time. At the same time the average fund produced negative alpha over the trailing 3 and 5 years and only modestly positive alpha over the last 10 years. Coincidence? We don’t think so. Producing excess returns mathematically requires a fund to deviate from its benchmark. In other words, when funds fail to deviate from their benchmark in a meaningful way they go a long way in ensuring that they will not produce excess returns. Meanwhile, the average fee for funds in this category is .7%, or roughly 18x higher than the fee for the Vanguard S&P 500 ETF (VOO), which sports an expense ratio of .04%. Tracking one’s benchmark almost perfectly while charging .66% more than the index tracking ETF is a perfect recipe for asset loss. So, are we really witnessing a migration from active to passive, or just a migration from passive to cheaper passive? We think we know the answer to the question above, but the more important question for money managers is how to identify those funds that actually do produce excess returns, because they clearly exist. 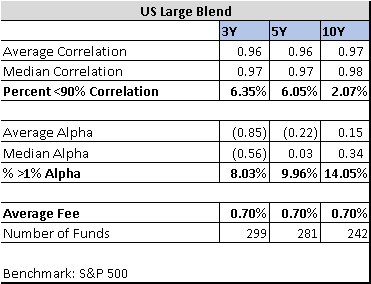 After all, fully 14% of funds in the US Large Blend category produced greater than 1% annualized alpha over the trailing 10 years. Here we offer one simple rule that dramatically increases the hit rate of identifying winning funds: focus your attention on mutual funds with less than 90% correlation to their benchmark. These funds produced greater than 1% alpha 21% of the time over the last 3 years, 41% of the time over the last 5 years and 60% of the time over the last 10 years. This one simple rule goes a long way in eliminating from consideration funds that are extremely unlikely to produce positive alpha: those that too closely track their benchmark.